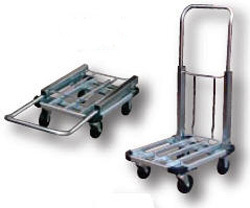 Fold-Up Aluminum Platform Truck. Telescoping aluminum frame has dual length platform; 25" extended and 16½" retracted. Easy steering with 4" hard rubber casters, two rigid and two swivel. Folded dimensions are 16"W x 20"L allowing the truck to fit into tight spaces for storage. Handle height is 37½" extended and 26½" retracted. Ideal for delivery, repair personnel, frequent travelers and salespeople. Specs: size 16" x 28"; platform height 6.5"; capacity 300 lbs.